While Hillary Clinton rushes to finalize her presidential campaign plans, her husband is also beginning to introduce himself to the public. 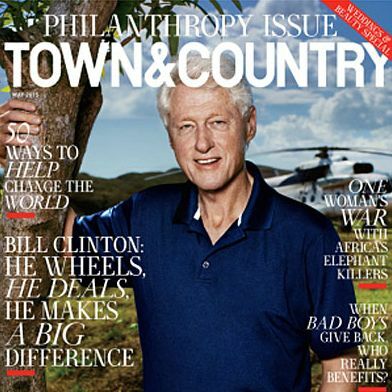 Bill Clinton will appear on the cover of Town & Country magazine’s April “Philanthropy” issue, according to Women’s Wear Daily. The shoot took place in Haiti, and Clinton was so busy that photographers only had three minutes to finish it. The potential First Hubby, known for his bold fashion choices, wore a dazzling blue polo shirt and a Panerai watch. Clinton, a recent grandfather, was asked what would happen if he and his family headed to the White House in 2017. “If Hillary becomes president, I’ll have to assess what she wants me to do,” he said. Clinton has a passion for philanthropy and healthy eating, so he’d have plenty of issues to champion at the White House.